Images of the Jewish festival of Yom Kippur in Israel. Israel has been observing the holiest day of the Jewish calendar, Yom Kippur, or Day of Atonement, when observant Jews atone for the sins of the past year by fasting for 25 hours and praying. 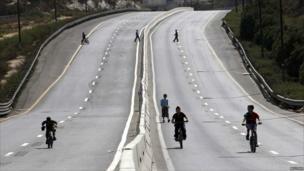 Shops are shut and traffic comes to a halt. A series of rituals are performed ahead of the day itself. 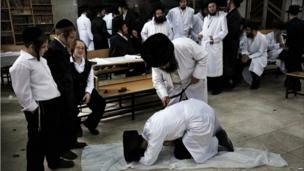 Here an ultra-Orthodox Jew whips another with a leather belt as a symbolic punishment for his sins during the traditional Malkot ceremony, a few hours before the start of Yom Kippur. 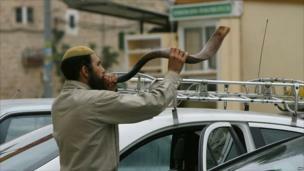 A Jewish settler blows the Shofar horn on the eve of Yom Kippur, near the disputed Ibrahimi mosque, known to Jews as the Tomb of the Patriarchs, during the weekly Muslim Friday prayer in the flashpoint West Bank city of Hebron. 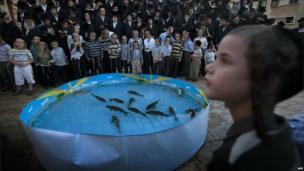 People pray in front of a plastic pool filled with water and fish in the ultra-Orthodox Israeli city of Bnei Brak, near Tel Aviv, as they perform the Tashlich ritual during which they cast their sins into the water. 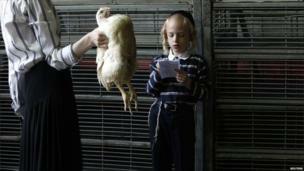 A woman holds a chicken as her son reads a blessing before performing the Kaparot ritual in Bnei Brak near Tel Aviv. Kaparot is a custom where white chickens are slaughtered in a symbolic gesture of atonement and donated to the poor.